We first featured Nico Castro three years ago when he was a very ill 6-year-old. He was recovering from a brain tumor measuring a little more than four inches in diameter. 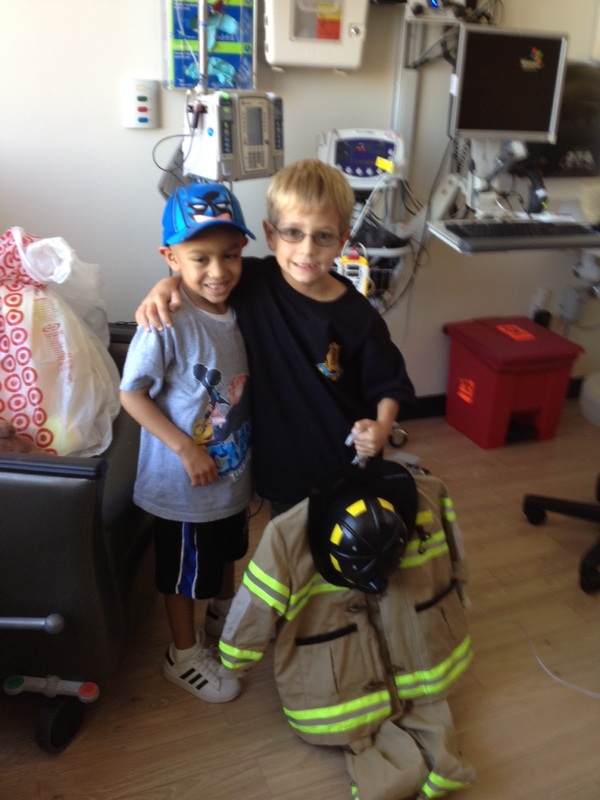 In the throes of his illness  in true superhero fashion  Nico wanted to help others. At the time, Nico was undergoing five days of cancer treatment. His wish was to be Batman for Halloween and go trick-or-treating. But things got tricky and bittersweet when doctors granted him a day off from treatment to enjoy his favorite holiday. This little Halloween hero with a big heart asked his parents if they could buy costumes and treats for the kids in the cancer ward. "I was sad they wouldn't have candy," Nico explained. His mother Marlene and her husband Raul Castro were moved by his thoughtfulness, however, it would be impossible to buy costumes and goodies for the more than 50 sick kids in the hospital. The family took a big financial hit after Nico's diagnosis. Nico knows what it feels like to have to sit on the sidelines during the holidays. 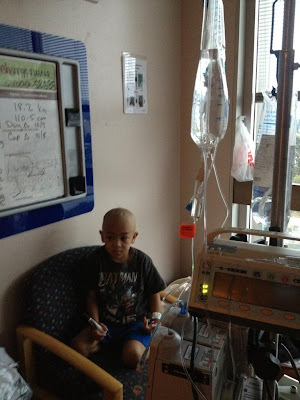 In November 2011, instead of celebrating, he was in the hospital too ill to take part in the festivities. He was diagnosed with medulloblastoma, cancer of the cerebellum. But during this scary time, all he could think about was if he would be healthy enough to celebrate Halloween. It's amazing to see how the community comes together when they're given a healthy dose of inspiration. After meeting Nico, I quickly realized his superhero power is inspiring people to expand their minds, be more compassionate and to open their hearts. Donations and kind acts poured in, including superhero capes, goodie bags filled with toys, balloons and more. Nico’s efforts resulted in donations more than 200 costumes and about $1,200 in cash. Today, Nico in stable condition and cancer-free. He is coping with the residual effects of the treatment that have affected his cognitive learning. He was pulled out of his school and was put into a special school for students with mild to moderate learning disabilities. Marlene says Nico isn’t happy about being in a different school. “He cried the first day and wants to be back at his regular school with his old friends.” Their goal is to get Nico’s cognitive learning up to speed so he can return to his regular school. Nico’s mother describes him as having become very empathetic toward other kids who are not the average child as a result of his illness. “He’s very aware of the differences in people,” she said. 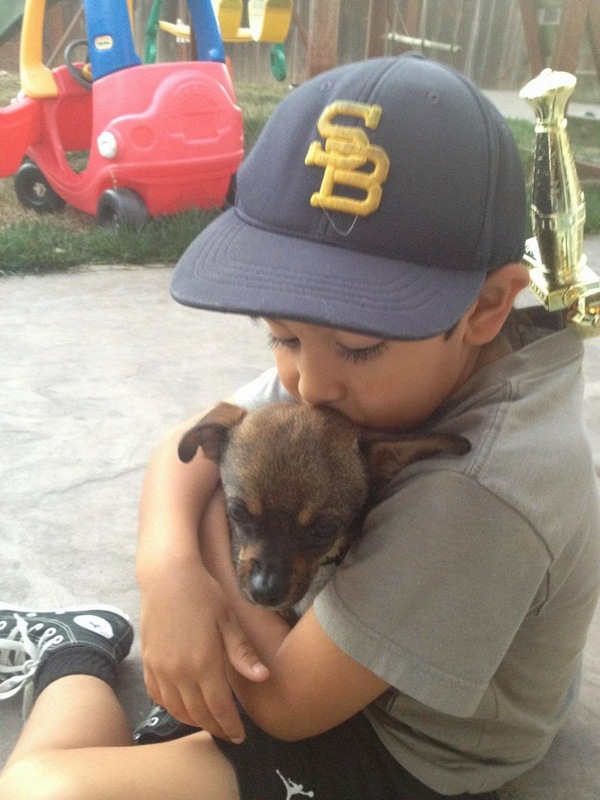 Last year, we gifted Nico with a puppy. He and his siblings love Lucky and fight over getting to sleep with him. He’s a calm dog who brings love to their home. Raise awareness for childhood cancer and support research to end this horrid disease: Volunteer, share this story, make a donation. Marlene recommendations organizations that give 100 percent of the proceeds to the cause like St. Jude Children's Research Hospital, St. Baldrick’s Foundation and Juliana’s Journey Foundation. Nico continues to collect costumes and Halloween goodies for his goodie bags every year. This year’s 50+ costumes will be delivered to Kaiser Permanente Santa Clara Medical Center in Santa Clara, Calif.
Marlene is searching for treatment to improve his cognitive learning. Resources she’s found are expensive. If you or anyone you know is a specialist in this field, please email us at info@goinspirego.com -- superheroes activate! 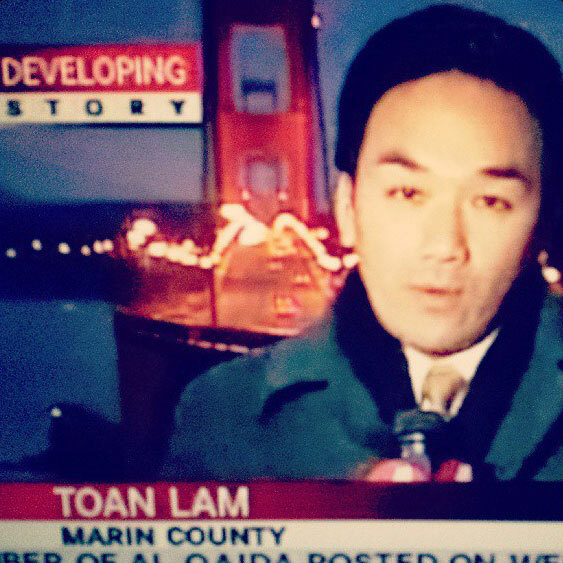 Being a TV news reporter was my dream growing up. I was inquisitive and loved to read, write and talk. Getting information first and sharing it with a mass audience thrilled me. Naturally, getting paid to do this seemed like a plum job. In many ways it was. But after a while, knocking on doors of grieving families, reporting on catastrophes and searching for bad news daily drained my spirit. I remember a crisp autumn “slow news” day. I was on the computer writing a script for a news report when the police scanners suddenly went abuzz. The producers became frantic. News broke about a school bus accident involving elementary school children. “Are there any injuries?” a producer yelled excitedly. About 20 minutes later and after some calls to local law enforcement agencies, it was confirmed that nobody was badly hurt or killed. I clearly remember some news “leaders” were visibly disappointed that it wasn’t the big news they had expected. Essentially, the lead wasn’t as big of a bleed. As I thought about my career, my reason for going into news was not meeting my zest for using my talents of connecting to people and storytelling – it was quite the opposite. I felt like I had betrayed my calling. In 2009, right in the thick of the economic downturn, I planned a trip to Peru. I mustered up the courage to tell one of my best friends Yasi that I was going to quit my job in San Francisco after our trip. Thousands of broadcasters vie for the 130ish on-air reporting gigs in the City by the Bay. Some of my mentors and friends advised against it. But it was time for me to stop avoiding the feeling in my gut that a new adventure awaited – my new calling. Here I was plotting my exit. “I’m going to give my two-week notice,” I told Yasi with a lump in my throat. The next day, I walked into the newsroom early with three story ideas ready to pitch at the morning meeting. As soon as I heard an intercom message from the HR department saying, “Toan Lam please come to HR,” I knew my thoughts preceded my actions and that the shift was happening. I would be lying if I told you I didn’t start feverishly looking for my next step – another job. I got some calls but felt like those opportunities didn’t align with me internally. Physically, my gut told me to wait it out. During this transition time I continued do reporting, but out of personal interest. One of the first stories I told was “The People of Tent City.” Many middle-class families that lost their jobs started pitching tents across the country because they felt they had nowhere else to go. Immediately after producing this story, change happened for the people I featured and heroes reached out to help. But the biggest shift happened in me. I was moved that the folks who lost nearly everything were generous enough to share their tents, blankets and bottled water with new tent city tenants. Through social media, high school students saw the video and were inspired to make presentations about the growing epidemic of homelessness in their community. They held a collection drive with just a few 55-gallon garbage bins. The result: a truckload of basic necessities donated to their homeless neighbors. A dentist reached out and asked me whom he could talk to about giving free dental care to some of the people I featured. What I learned here is follow your gut. You don’t have to be drastic and leave your job like I did. Start small. Look around. Pay attention. Tell people that you want to volunteer your time. The rest will follow. Another huge lesson I learned (I tell this to every student and mentee that comes my way) is to be careful what you think. Your thoughts become your words. Be careful what you say because they can become reality. Words can hurt just as much as they can heal. So once you start thinking negative thoughts, zoom out. You’re the author of your own book. What’s your gut telling you? How will you rise to meet your best self? We want to know!